Being good friends with someone who has Celiac Disease, I’ve learned a lot about gluten free cooking. Gluten free spaghetti and meatballs, Eggplant Parmesan, and Noodleless Butternut Squash Lasagna, are just among some of the many things I’ve made with/for my friend Devon. Not to mention, she also contributed to the blog with Gluten Free Udon Noodle Soup and Venison Chili, so gluten free recipes are definitely well-represented here on Eisforeat. When I was doing some research for “X week” and l discovered that Xanthan Gum is a common binding component in gluten free baking, and I was thrilled. (As you might imagine, finding ingredients or dishes that start with the letter “X” is not the easiest thing in the world). Xanthan Gum can be pretty pricey, but fortunately, my favorite Grocery Store, Rainbow, sells it in bulk. So I literally was able to purchase a teaspoon of it for about 16 cents. Now for what to make. Since I was having girls over for theBachelor Finale Monday night, and the final episode was shot in Switzerland, I knew we just had to bust out my fondue pot, which has been sitting in a cupboard, unused, for years. I decided to make a gluten-free vanilla pound cake for dipping in a chocolate fondue. Of course, you’ll need some gluten free four. From what I’ve read, it’s best to use a blend of a couple different types. You can make this on your own, OR, if you shop at a place like Rainbow Grocery, they sell a Gluten Free Flour blend in bulk. (It’s made by Bob’s Red Mill, so I’m guessing you could find this packaged as well). If you can’t find a pre-made mix, you can make your own by combining 2 cups rice flour, 2/3 cups potato starch and 1/3 cup tapioca flour. Mix well with 1 teaspoon of Xanthan Gum. To make the cake: combine sugar and melted butter in large bowl. Beat at medium speed, scraping bowl often, until creamy. Add 1 egg at a time, beating well after each addition. Add vanilla and beat until well mixed. Stir together gluten-free flour blend and baking powder in small bowl. 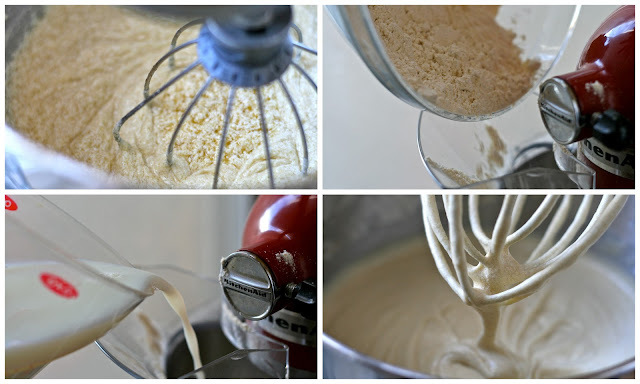 Gradually add flour blend mixture alternately with milk to butter mixture, beating at low speed until well mixed. Pour batter into prepared pan. Bake for 60-65 minutes or until toothpick inserted in center comes out clean. Cool 10 minutes; remove from pan and cut into cubes. Onto the fun part...CHOCOLATE! Chocolate fondue is super simple. All you need is some heavy cream, chocolate, and I added some Baileys. (Don't judge me). Pour into fondue pot to keep warm during the party. From there...it's... Stab. Dip. Enjoy. We also served with strawberries and marshmallows. Heat oven to 350°F. Grease 12-cup Bundt® or 10-inch angel food cake (tube) pan; sprinkle with gluten-free flour blend. Set aside. Combine sugar and melted butter in large bowl. Beat at medium speed, scraping bowl often, until creamy. Add 1 egg at a time, beating well after each addition. Add vanilla; beat until well mixed. Stir together gluten-free flour blend and baking powder in small bowl. Gradually add flour blend mixture alternately with milk to butter mixture, beating at low speed until well mixed. Pour batter into prepared pan. Bake for 50 to 60 minutes or until toothpick inserted in center comes out clean. Cool 10 minutes; remove from pan. Warm the cream over moderate heat until tiny bubbles show and begins to lightly and slowly boil. Add the chocolate and whisk until smooth and full incorporated. Immediately transfer to a fondue pot heated at low or with a low flame, or serve straight from the pot. Arrange the dippables on a platter or plates around the chocolate pot. Use a fondue fork, bamboo skewer, seafood fork, or salad fork to dip the fruit pieces and other dippables into the hot melted chocolate mixture. Eat immediately. **If the fondue begins to feel a little stiff, add a tablespoon of heavy cream and stir. Gluten-free eating can be challenging, especially in the beginning. Whether you're just learning to eat gluten-free, or trying to cook for a gluten-intolerant friend or family member, food blogs can be some of your best friends. At Emelia's you can find more information.